Born in St. Catherine, Jamaica on 14 February 1987, a day when the world is always full and pregnant with love, Christopher Oteng Martin will go on to win Jamaica’s Digicel's Rising Stars in 2005. 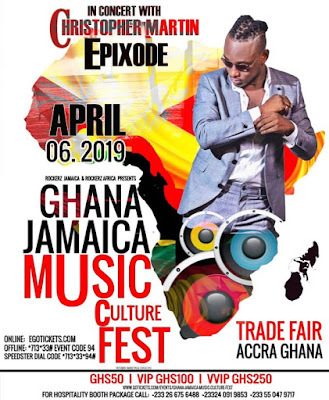 Christopher is best known in Ghana for the songs "Cheaters Prayer" and "Paper Loving". 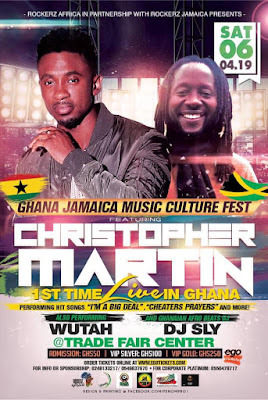 Christopher Martin is a reggae/dancehall singer and songwriter. During high school years, he developed a love for dramatic arts and sports graduating in 2003 with various awards and accolades. Christopher’s debut single "Love Is All We Need" formed part of the promotional campaign of Digicel's Christmas promotion in 2005 making him the first Digicel Rising Stars Alumni to have a hit single on the charts in Jamaica. Shortly after, he won the Digicel Rising Stars title in 2005. Cleveland and Maxine Martin, parents of Christopher played major roles in his growth as an artiste. Already a national household icon, Christopher’s main objective is to take his music to the optimum level. 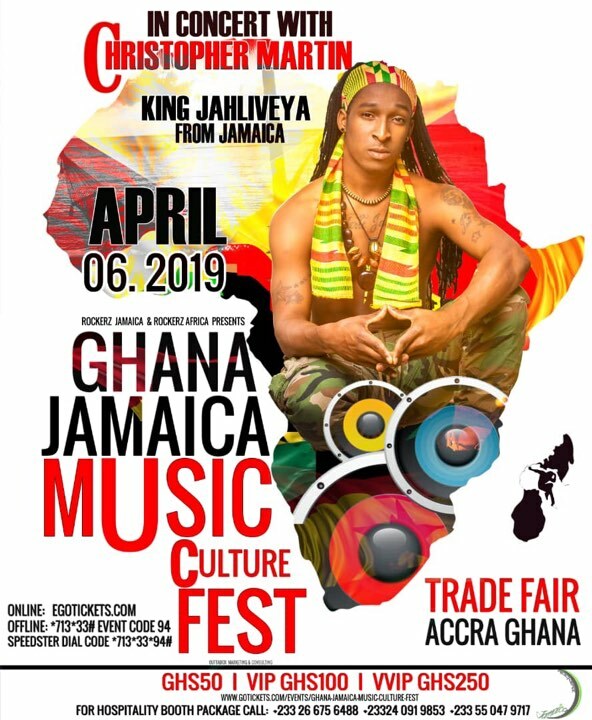 Hence, his readiness to perform first time ever in Ghana, West Africa. 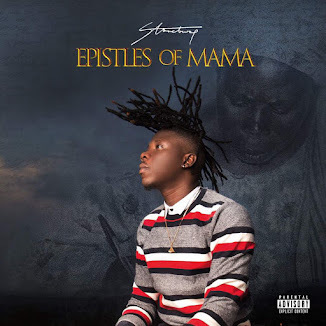 His releases include: "Mama", "Let Her Go", "Is It Love", "Giving It", and the singles "Jamaican Girls" and "Gallis" featuring Busy Signal. He has worked with a number of top producers in reggae and dancehall including Robert Livingston (Big Yard), Arif Cooper, Shane Brown (Jukeboxx) and Christopher Birch. Martin has performed numerous stage shows across Jamaica and was notably invited to perform at One Night with Michael Bolton and at the 2008 Air Jamaica Jazz Festival. 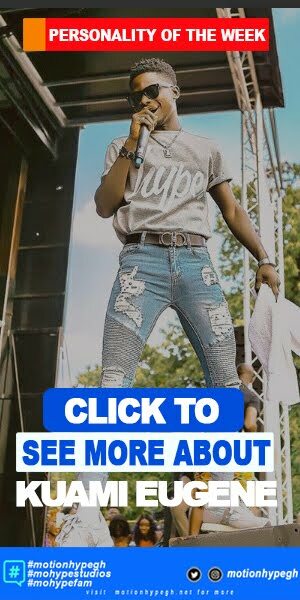 2008 was a productive year for Martin, being nominated for numerous awards including The Jamaica Observer Teenage Choice Awards and Excellence in Music and Entertainment. With several singles receiving airplay on radio and reaching the Jamaican music charts, Chris has always been optimistic about his career in music. In 2013, Martin signed to VP Records. 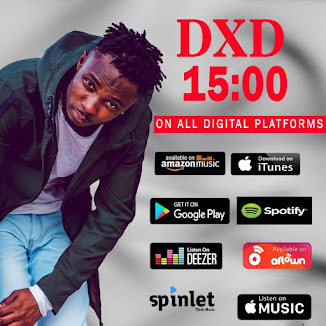 In April 2016, he toured Zimbabwe and performed live on stage alongside D'Major and several Zimbabwean singers, including Winky D. This show took place at Glamis Arena in Harare and was a success. In Ghana, on Saturday, April 06 2019 Christopher Martin is set to perform live in concert with some of Ghana’s rich list of talented artistes including Afriyie of Wutah fame. A fuller list of artistes billed to perform including talented acts like Epixode, Josh Blakk, Offei Music and many more shall be communicated with a twist of surprises bound to excite Ghanaians. This concert is by courtesy Rockerz Africa in partnership with Rockerz Jamaica, a company ran by industry professionals with years of experience spanning a 20 (twenty) year timeline with a rich portfolio of events successfully organized in Jamaica, USA, Sweden and several other countries. 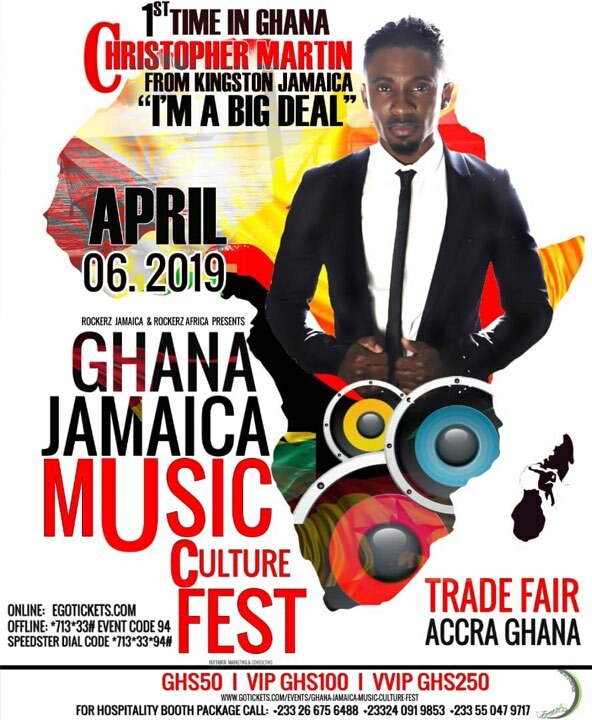 Christopher Martin Live in concert is under the Ghana Jamaica Music Culture Fest 2019 edition scheduled to take place at the Trade Fair Center, La – Accra. Tickets are on sale for GHS 50 for General Admission, GHS 100 for VIP Silver and GHS 250 for VIP Gold. Dial *713*33# on your phone. Use the event code 70 to find the event and register. 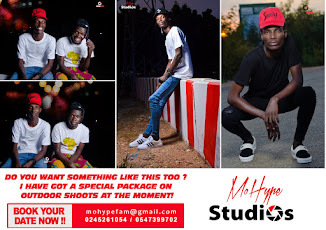 Make the date and don't be late.